Now that the Northeast’s terrible winter is a distant memory, photographers are fully enjoying the warmer weather. For sky watchers and astrophotographers, that means spending the night outside. The sky is always changing, and some of the most brilliant stars take center stage during the summer months. The easiest to find is the Summer Triangle, which is comprised of three bright stars: Vega in the constellation Lyra, Deneb in the constellation Cygnus, and Altair in the constellation Aquila. The stars appear in the east at dusk, high overhead after midnight, and in the west at dawn. If you are away from any light pollution, finding the Summer Triangle will also allow you to observe the Milky Way, which passes right between the stars. To find local star parties, you can check out the South Jersey Astronomy Club and the Amateur Astronomers Association of New York. In New Jersey, the organization meets in one of the darkest observing areas in the state — the recreation field at Belleplain State Forest. You can find sky watch dates and times here. 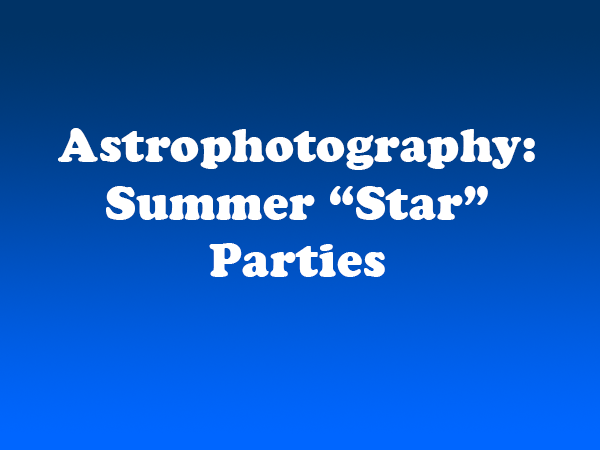 The SJAC is also hosting a Fall Star Party there from October 8-11, 2015. While it can be difficult to escape the bright lights of the big city, the AAA of NY meets on the High Line in New York City every Tuesday and hosts “Journey to the Stars” observing sessions on Thursday evenings at the Brooklyn Bridge Park. When outside of the NY/NJ region, you can find event information at NASA’s Night Sky Network. If you are willing to travel, Vermont is home to Stellafane, one of the country’s largest and well-known star parties. The annual convention, which will be held August 13-16, features speakers, workshops, demonstrations and events for astronomers of every level.